Following Council authorization, the Austin Transportation Department is hosting a public engagement process to help inform a Dockless Bike Share Pilot Program. Dockless Bike Share is different from the City’s current bike share system, Austin B-Cycle, in that the bicycles do not have to be parked and locked in a “dock” or station. 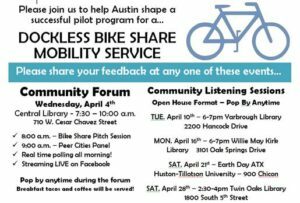 On Wednesday, April 4th from 7:30am to 10am at Austin’s Central Library, we invite all Ausinities to participate in the first of several community gatherings about how best to structure a dockless bike share pilot program. Additional listening sessions follow throughout the month of April. Please see above for more information. Bike Share is a shared mobility service that offers bicycles for use by the public for a fee. Currently, the City of Austin owns and operates a station-based bike share service called Austin B-Cycle consisting of 590 bicycles and 64 stations. Bike Share has changed significantly in the last year such that several companies now offer this service without relying on docks (stations) to return the bikes. The City of Austin is conducting a public engagement process to inform a pilot demonstration program to test this new “dockless” service. The goal of the pilot is to test the value of a blended station and dockless system in expanding mobility choices for people in Austin through a well-managed hybrid system. We hope you will join in this important community conversation! Location: Zach-Topfer Theatre, 202 South Lamar Blvd. About the Event: The great energy transition will have an impact on our built environment, our parks, our culture, and our visual landscape like no other technical shift since the automobile. By presenting examples of utility-scale renewable energy infrastructure as public art, the Land Art Generator Initiative (LAGI) is inspiring the public about the beauty of our sustainable future, and showing policy makers and city planners that distributed energy resources can be placemaking tools, economic development drivers, and educational venues while they help to power the grid and implement a clean energy revolution. Recreational spaces like Seaholm Waterfront and parkland at the former Holly Shores Power Plant have the potential to tell the stories of power generation past and present through public art. Join us and learn how your community can make it happen! n Elizabeth Monoian is the founding co-director of the Land Art Generator Initiative, an organization that is developing global partnerships between private & public entities around interdisciplinary projects that address issues of climate and sustainability through the lens of creativity. n Robert Ferry is a registered architect and LEED accredited professional and supports the critical role of architecture & urban design as part of a comprehensive solution to climate change. He is also the co-founder of the Land Art Generator Initiative. The impacts of climate change are here and becoming more and more apparent. One existential climate issue is the impact of climate change on local water resources. Water utilities are already experiencing the effects of a changing climate on their water supplies, not to mention the stress water supplies are experiencing in rapidly urbanizing areas. On May 2, 1:00 PM – 5:00 PM at the Palmer Events Center, Austin Water will host a one-day forum “Creating Resilient Cities,” that focuses on how water utilities are leading the way in adapting to climate change to enhance resilience for our communities. This forum is cohosted with the Water Utility Climate Alliance (WUCA), a leader in this field and currently marking its tenth year, and the City’s Office of Sustainability. Renowned climate scientist Katherine Hayhoe from Texas Tech will give the plenary keynote. Register here. This forum will feature three sessions exploring issues such as water rights and regional collaboration in the Colorado River basin of the arid Southwest, creating resilient utilities in the face of extremes, and the opportunities and challenges of incorporating climate information into a range of water sector functions. Water utility leaders will discuss the particular challenges faced by their utilities and what they are doing to meet these challenges. Upcoming Opportunities in Bamboo Architecture! We are so glad to share this upcoming bamboo architecture project fueled by one of our previous AirCrete workshop students, Maya Boone. This summer, Bahia Beach Construction is offering opportunities for folks from all around to come collaborate with our coalition of builders and community members striving to rebuild communities with sustainable green technology through harnessing the power and strength of locally sourced species of bamboo. 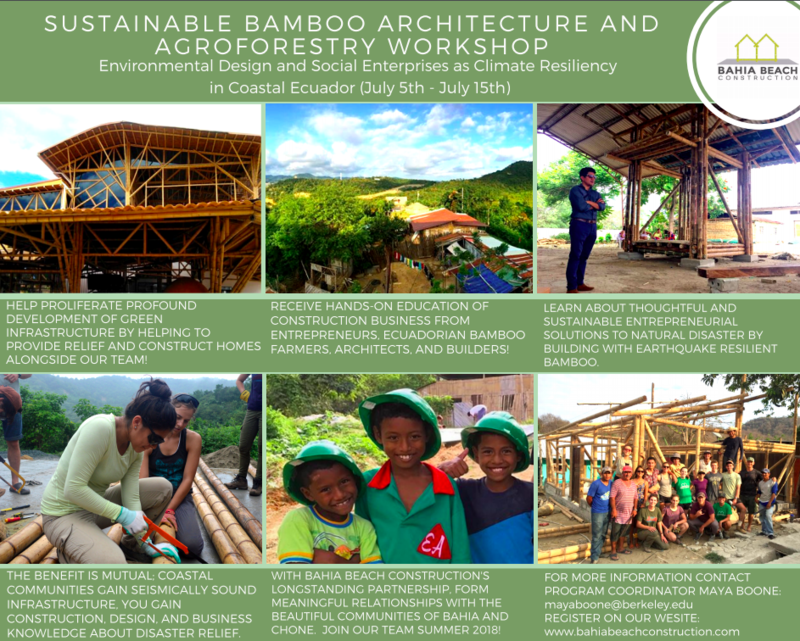 Participants will receive lessons and instruction from world renowned Ecuadorian architectural professors, carpenters, and bamboo farmers who have been actively rebuilding since the earthquake, as well as have the opportunity to collaborate with local university engineering and architecture students. Participants will also be instructed in the usage of tools with the ultimate goal of building a community structure and help develop our new ecological education center, bamboo treatment and training facility, and agroforestry cultivation operations in the rural region of Chone. 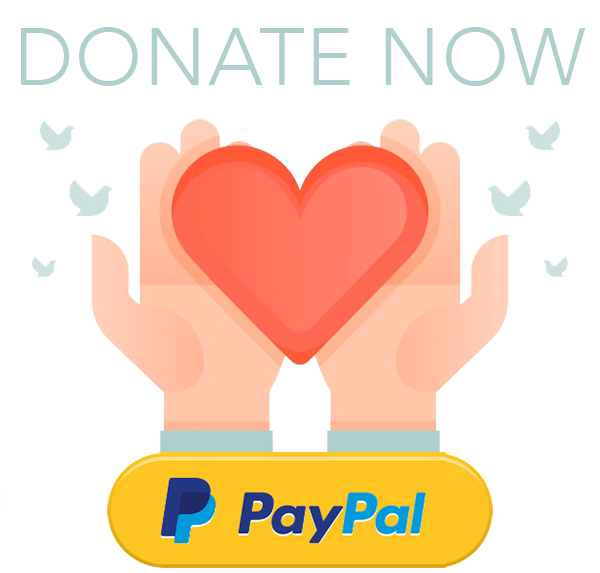 See more information on registration, payment, the people behind this movement, photo gallery of their constructions, and more here on their website! Please contact Program Coordinator, Maya Boone at mayaboone@berkeley.edu if you are interested in attending an info session so she can set up a Facetime/Skype/in person meeting to get you all the information you need! Hope to have you join this team! Please see attached materials below for more information! This event is FREE WITH 2 NON-PERISHABLE GOODS DONATION OR $5 ENTRY. We are here to create more availability and awareness of healthy living opportunities in the Austin area. Our first Natural Living Festival in 2014 brought over 600 attendees. This year, we are anticipating more than 1000 people, and have already received great enthusiasm from a growing community. 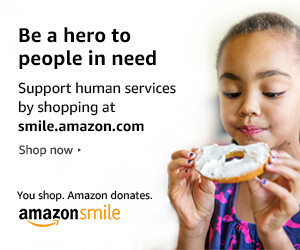 It is our primary goal to support individuals and families by connecting them with resources to live a happy and sustainable life. For more information please click on the guides below. Copyright © 2019	Design by Om Girl Marketing.